IE8 & 9 both throw exceptions on this, but they're silent for some reason unless you have IE9 script debugging on, in which case "SCRIPT65535:" is thrown. I understand the desire to not special-case every host object, but it seems worth throwing a try/catch around the checks there to return false (as jaubourg suggested in #7780) given that nothing but a non-plain object should be causing an exception here. At the very least that would prevent a silent exception from being thrown. I did not use jsfiddle because this requires a popup window on the same domain, which it doesn't look like you can do with their tech (at least not easily without some hacks). Tested on 27291f, confirmed still there. This is not a jQuery issue. The exception being thrown was caused by you calling console.log(). As soon as I added firebug-lite, the errors dissappeared.. The exception is being thrown in the extend function for me...check ​http://nerdlife.net/jquery_bug_test.html again...even when you don't enable debugging on IE9, the alert I added after the extend function does not get executed. Sorry for the collision, I had assumed this was queued up to be looked at later :). I agree that this is a weird use case that should be avoided, but throwing an exception (or sometimes pseudo-silently failing) is a pretty bad failure case when doing this. Given that an object that throws an exception when trying to access the constructor is most certainly not plain, it seems worth the added lines to detect. This adds another inconsistency to isPlainObject across different browsers, but if the goal is to detect situations where normal operations on objects should not be performed, then this seems better than an exception. If the url needs to be passed back, why not use window.location.href? In this specific case, this was a bug in my code, and the solution was to just toString() the object (which I should have done in the first place). More generally, we have a system to transfer data between windows so that they can persist between pages. 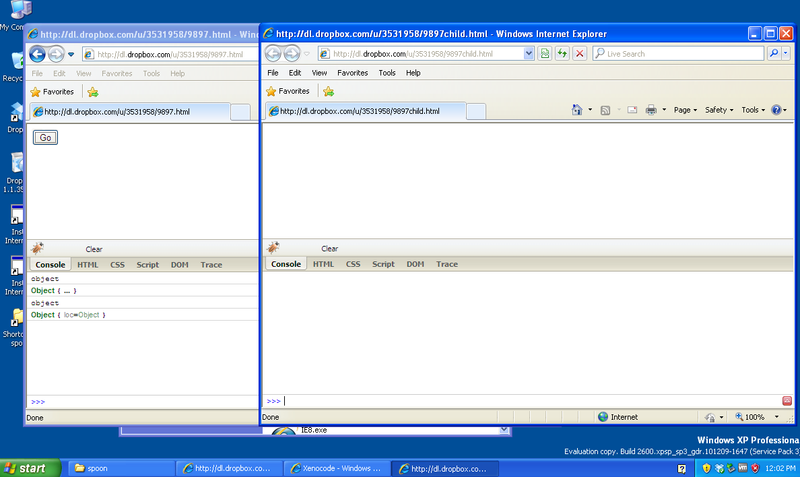 Due to arbitrary garbage collection policies in IE we deep copy everything in the new window. Generic deep-copying like this where you're not 100% sure what's going to be sent into it is the reason I think we should handle the failure case...there's no obvious reason for isPlainObject to throw an exception, it would be like isArray throwing an exception. Fixes #9897. Wrap obj.constructor test in try/catch to avoid problems with host objects. Thanks to bkrausz.